At least 20 million Bibles are currently sold each year in the U.S. in addition to tens of millions that are distributed free. In 1956, that number was about 8 million in the U.S. The American Bible Society advises that they distributed 60.2 million Bibles last year in the U.S. The American Bible Society advises that since their inception in 1816, they have distributed over 7 billion Bibles worldwide in conjunction with the United Bible Societies. The American Bible Society advised that there were over 6 million Bibles distributed in China last year, but also said that there is no one gathering complete information on these statistics worldwide. The United Bible Societies distributed more than 578 million Scriptures worldwide in 2002 (including Bibles and portions of Bibles). The Gideon's International distributed 59,460,000 Bibles worldwide last year (This is an average of over one million Bibles every week, or about 113 per minute). All Gideon's Bibles are distributed free of charge with funds obtained from donations, wills, etc. The Gideons have placed 1,880,480,000 Bibles since they began in 1899. The International Bible Society sold 8.5 million Bibles in 2002. In the last 40 years, eight new Bible versions published in English have sold well over 100 million copies. (These versions include: Good News Bible, New English Bible, Living Bible, New International Version, etc.). The number of editions of the Bible that readers are buying is staggering. Most other books are available in only two editions: hardcover and paperback. In contrast, just one Bible publisher, Zondervan, has 350 editions of the Bible in print this season. About 92 percent of Americans own at least one, and the average household has three. Two-thirds say it holds the answers to the basic questions of life. A recent Gallup survey advises half of Americans say they read their Bibles at least once a month. Research sponsored by the Christian Booksellers Association and Zondervan publishers advises that the average Bible consumer owns nine Bibles, and that he or she "is looking for more". The Bible easily would blow away any other best seller on the national book list which is the reason it is routinely excluded from these lists. In the weeks following the terrorist attacks in the United States on 9/11/01, Americans were seeking spiritual comfort and answers, causing sales of Bibles to spike. Family Christian Stores, the largest Christian bookstore chain in the United States with 350 stores in 39 states, said sales of Bibles jumped 27 percent the week of Sept. 16. The demand for Bibles has not been limited to traditional Christian markets. Sam's Club reported a sales increase of 40 percent after the attacks. At the start of the nineteenth century, Bible translations were available in just 68 languages. Today, scriptures are available in no less than 2,287 languages, with another 21 languages added just last year. The 10,000 copies of the first edition of the Bible in Mongolian sold out on the first day. Far from waning in the 4,000 years after the first of these God inspired words were recorded, the Bible's influence and power continues to grow. 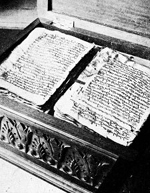 The system of the Bible being divided into chapters was introduced in 1238 A.D., while the verse notations were added in 1551 after the advent of printing. Click here for a list of Bible Promises relating to God's Holy Word.